Lomo made this plastic-bodied Twin lens reflex medium format camera beginning circa 1980. It was a small revision to the 1976 Lubitel 166, adding a self-timer. Of its two lenses, the lower one, with the shutter, exposes the film, while the other serves the viewfinder. The two lenses both screw in and out for focusing (rather than being mounted in a racking front-plate as in many TLR cameras); each lens has gear-teeth around the edge, and the two are meshed to couple their focus. There is a focus scale on the viewing lens. Like the earlier Lubitel models, the 166B's viewfinder has a condenser lens rather than a ground-glass screen, with only a small central spot ground for focusing. This (it is a design copied from the focusing model of the Voigtländer Brillant) requires some care in focusing, but gives a much brighter view for framing than would a full-frame ground-glass screen. 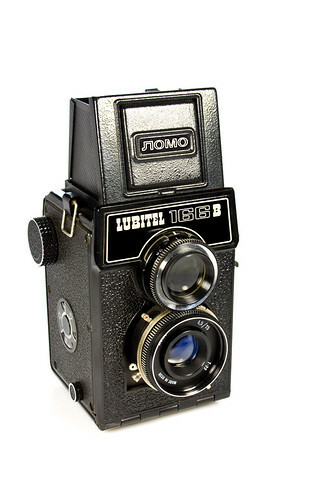 The Lubitel 166B uses 120 roll film and exposes 6x6cm square images. Shutter speeds are from 1/250 to 1/15 and a bulb setting; the shutter is synchronised for flash, with a PC socket on the lens barrel, and a cold shoe on the left side of the camera. The lens is a coated 75 mm f/4.5 T-22 triplet lens, with aperture down to f/22, and the close-focus limit is at just over a meter. This accepts 40.5 mm threaded hood and filters. The camera was sold with a synthetic leather strap, a vinyl case, a push-fit lens cap and a cable release. This page was last edited on 5 March 2018, at 11:36.